This is a continuation of Lumpsum vs. Dollar Cost Averaging (SIP) that modeled different return series and concluded that a prudent investor would be better off with a SIP because of a smaller probability of incurring a large loss. However, we stopped short of comparing different indexes to see if the conclusion held. The small cap index was chosen on purpose to illustrate how ‘average’ returns relate to real returns on an extremely volatile index. The average return series is, of course, a fantasy. What we are interested in is in the probability of getting those returns. The vertical lines mark the different thresholds we are interested in. The grey line on the left is at zero. We have SIP showing a 4.44% probability of negative returns and lumpsum showing 3.49%. Yes, there is a non-trivial possibility that SIPs will give negative returns. However, looking at the shapes below zero, SIP losses may not be as large as lumpsum losses. The red line in the middle is the start to finish return of the index. 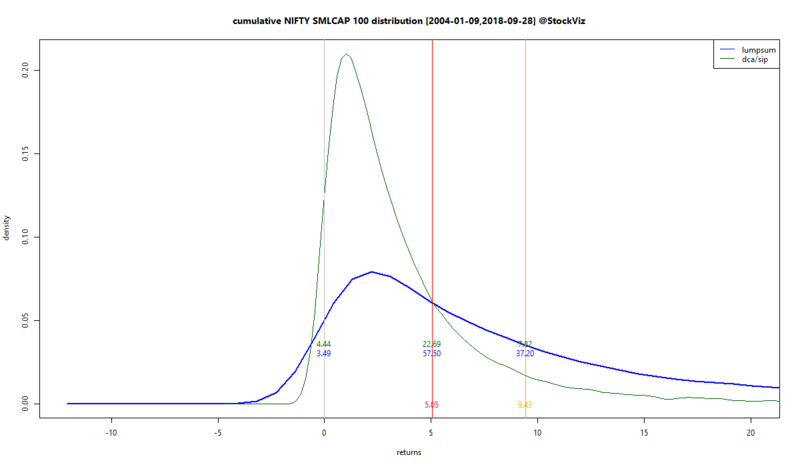 Here, we have SIP showing a 22.69% probability of exceeding those point-to-point returns and lumpsum showing 57.50%. The orange line on the right is the compounded ‘average’ return. We have SIP showing a 7.82% probability of exceeding that and lumpsum showing 37.20%. 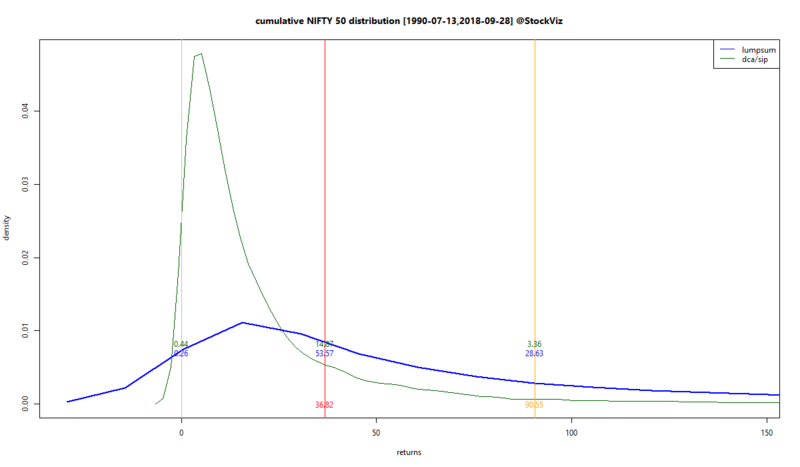 It is possible for SIP returns to be negative over large periods of time. Enough to cover your entire investing lifetime. So, if you are investing in small-caps, make sure you are not 100% allocated to it. Lumpsum investing gives you a higher probability of higher returns across all indexes. 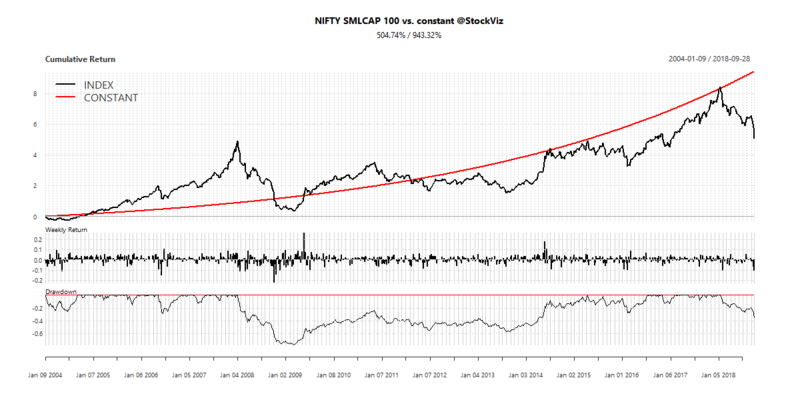 The probability of negative returns are on par with that of SIP’s. Lumpsums have fatter left tails. 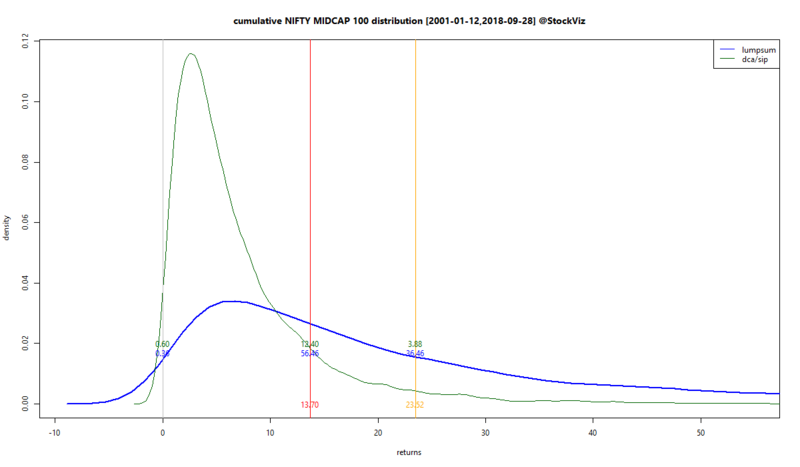 However, if you are looking only at NIFTY 50 and MIDCAP, those probabilities are tiny. Lumpsums have a higher probability of achieving ‘average’ returns compared to SIPs. Lumpsums seem to be benefiting from “time in the market” on indexes that rise over a period of time. Code and charts on github.